/ Modified sep 15, 2016 9:53 a.m. Though when it rains it doesn't pour everywhere, with some areas receiving less. 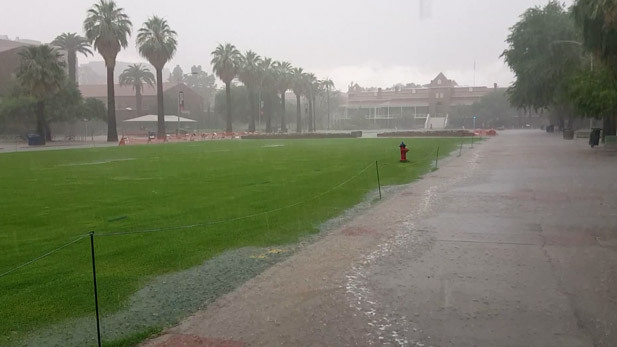 An intense rainstorm floods the mall on campus of the University of Arizona. Arizona's monsoon season is nearing an end, and rains this year have been pretty good so far, said the National Weather Service's Ken Drozd. "Most folks are normal and many are actually above normal for rainfall totals," he said. But, as always, it depends on where in Southern Arizona you’re standing. "One area that’s maybe an exception is far out to the west of Tucson and in western Pima County - not getting as much rain as Tucson and further east." Drozd said the monsoon has come in stops and starts, with strong rains in the end of June, a slow July and August and a relatively wet September thanks to Hurricane Newton. "That’s just the character of how things went this year as far as monsoon 2016." Drozd says there’s no real rain forecast in the next few days, but there could still be more to come: Monsoon season ends Sept. 30.